The fabulous peeps at Sourcebooks has given Passages to the Past 2 copies of the stupendous novel, The Forever Queen by Helen Hollick!!!! Aren't they the best?! 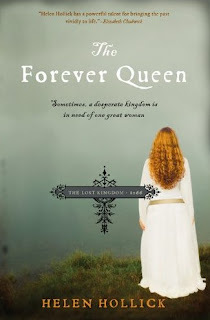 I have recently had the joy of reading The Forever Queen (READ MY REVIEW) and trust me when I tell you that this is a read you will NOT want to miss! SYNOPSIS: What kind of woman becomes the wife of two kings, and the mother of two more? - For +5 additional entries each, please comment on the Author Interview with Helen Hollick. - Giveaway ends on November 12th. I'd love to win this, you always have the best giveaways! This sounds so good! Please enter me! +5 I commented on your review. I love her SeaWitch Chronicles and really want to read this one. Thanks for the giveaway! Just love those share buttons...don't you? I tweeted and I faced my wall...now I'm off to add this giveaway to my sidebar. I've seen great reviews of this one and would love to win a copy. Cool, I'm first! I'd love a chance to win a copy. Thanks, Amy (and Sourcebooks)! Sounds like my kinda historical! Plus I am in love with this period of history and have done extensive reading and research on the period from around 850-950 A.D.
Count me in for the drawing, please. I'm going to put a note about the contest in the sidebar of my blog at www.justonemorepageblog.blogspot.com. Thanks so much for the chance to win and the introduction to what sounds like a wonderful author and novel. Wow! Awesome Giveaway! I have been wanting to read this! Thanks for the contest! please enter me i would love to read this! i am a follower! What a great giveaway! I am ready to move into this period of history, and this book seems like a GREAT place to start! Thanks so much for offering this book to your followers. What a story this must be. I love historical novels and this one should be interesting. Good luck you lucky entrants! Major green with envy moment! I've read the original "Forever Queen" by Helen and it's a wonderful story that I can highly recommend. I would love to read the newer version! I'm really excited about this one! Please enter me - mclean416(at)gmail(dot)com. I commented on the interview post and tweeted: http://twitter.com/#!/alexamclean (my twitter is private.. but I think you follow me.. but not 100% sure). I read and loved The Hollow Crown, now time for a re-read, so I'd love a copy of this new, edited version. Thanks for the giveaway. +5 - I commented on the wonderful interview. I would love to win this! It sounds so good and has been on my wishlist for some time now! +5 for comment on author interview! +1 for sharing on Facebook: http://www.facebook.com/#!/permalink.php?story_fbid=143125882401709&id=541104522. I would love to win this book...really can't wait to read it! I would love to win. This sounds like a great book. I commented on the author's interview. It's so cool that you were able to interview her. I would love to win this book. Please enter me in the contest. I commented on your review and interview. +5, I commented on your interview. +5 for commenting on Author Interview! Thanks so much for this giveaway. Your blog has introduced me to many new to me authors. I commented on your interview which was very enlightening. What a great giveaway. Thank you for including me. +5 Commenting on the interview. So glad to see this being published in the US. I had been going to order it from the UK when I saw it was to be published soon by Sourcebooks (I do love that company!). It's on my Christmas wish list, but would love to win it to make room for other wished for books! Oops forgot to add that I posted the giveaway on Facebook. The cover is evocative and drew me to the book the first time I saw it posted. These are people and a time period that is not often covered. I really look forward to reading this book. Commented on the author interview. How sad and discouraging for her first book in the UK had such poor support from the publishing company. wow..another great review blog for me to add to the collection! Thanks for the giveaway. Enter me! I'd love to be entered in the drawing. This sounds like a fantastic book. I'm sorry, I forgot to add my email address! I know you have already given this away but I LOVED this book. a must read. ooo! Wonderful giveaway! Thanks for the chance. +5 left a comment on the interview - I really enjoyed it! I'm reading great reviews of this book. The Forever Queen sound wonderful.Please enter me in the giveaway.Thanks for the wonderful giveaway. +5 I commented on your review.augustlily06(at)aim(dot)com. I would love to read The Forever Queen. Please enter me in this giveaway! +5 I commented on your author interview. I would love to win this book! I don't know much about this Norman queen.